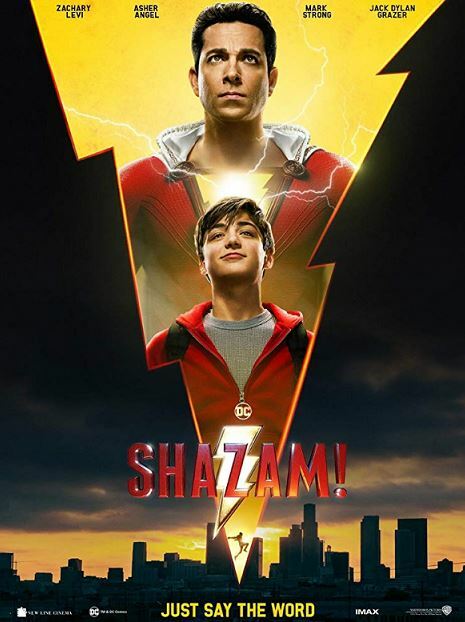 In Philadelphia, 14-year-old Billy Batson (Asher Angel) is searching for his mother, having gotten separated from her during a carnival as a child. Over the years, he’s run away from several foster homes in his continuing quest to find her and the most recent doesn’t want him back. However, a home run by Rosa and Victor Vasquez (Marta Milans and Cooper Andrews) welcomes him. He’s introduced to his foster siblings, Freddy Freeman (Jack Dylan Grazer), Mary Bromfield (Grace Fulton), Darla Dudley (Faithe Herman), Eugene Choi (Ian Chen) and Pedro Peña (Jovan Armand), but he remains standoffish. He doesn’t participate in a dinner-time ritual of joining hands and at school the next day he hurts Darla’s feelings by telling her they’re not actually related. To his credit he immediately regrets this, in large part because Darla (who’d greeted him with an enthusiastic hug) is a little kid. Later that day, when some bullies beat up Freddy, who walks with a crutch, Billy defends him. He then eludes the bullies in the subway system. On board the train, the other passengers vanish, leaving Billy alone. The windows ice up and the doors open to reveal a large cavern. This, we later learn, is the Rock of Eternity. Billy encounters an old man sitting on one of seven thrones. The man (Djimon Hounsou), who identifies himself as the wizard Shazam, says he’s chosen Billy as champion. He tells Billy to grasp the staff he’s holding and say his name. Billy acquiesces, primarily to humor the old man, and is transformed into an adult wearing a red costume and white cape (Zachary Levi). This, of course, is Captain Marvel. Well, not any more, as I explained last month. However, while the “Big Red Cheese” is now called “Shazam” in the comics, he’s never officially given a name in the movie. For convenience sake, I’ll refer to Billy’s superhero persona as “Shazam” from now on and the wizard as the Wizard. Ironically, Djimon Hounsou also appears in Captain Marvel as Korath, a character he first played in Guardians of the Galaxy. The Wizard, who crumbled to dust upon transferring his power, had been seeking a champion for a long time. Decades earlier, he’d tested a young Thaddeus Sivana (Ethan Pugiotto), but Sivana failed to prove worthy and was rejected. In the present day, a short time before Billy is given the power, the adult Sivana (Mark Strong) has discovered how to return to the Rock of Eternity. He confronts the Wizard and frees the Seven Deadly Sins, who take up residence in his body and give him super powers as a result. With help from the Sins, who manifest in large, monstrous forms, he kills his father and brother (John Glover and Wayne Ward), along with the board of directors at his father’s company. Shazam convinces Freddy that he’s a transformed Billy and turns to him for help in figuring out what’s going on. Freddy declares himself this new superhero’s manager and tries to come up with a number of superhero names, including “Captain Sparklefingers” (because of Shazam’s ability to generate bolts of lightning. Shazam roundly rejects that name. Shazam and Freddy conduct a series of tests to determine what powers he possesses. He has strength, bullet immunity and hyper speed. On the other hand, he’s not doing too well when it comes to flying. He also has no idea how to change back into his normal self, so he and Freddy sneak into the Vasquez house under cover of darkness and head upstairs. Darla witnesses this transformation, but Billy and Freddy swear her to secrecy. Meanwhile, Sivana has learned of this new champion and seeks to destroy him before he can realize his full potential. For his part, Shazam performs a lot of tricks for the crowds and poses for selfies. One trick inadvertently causes a bus to crash and fall from a bridge, but he catches it. Shazam catches the falling bus. Later, Sivana, having seen Freddy and Shazam together in TV news footage, threatens the boy. 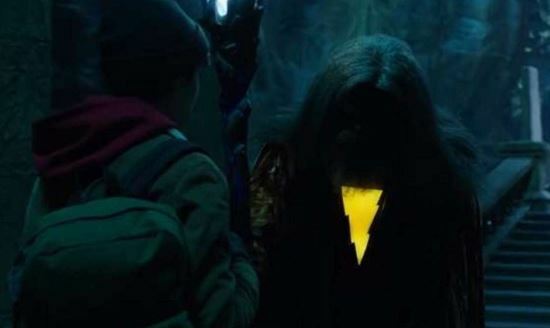 When he subsequently learns where Freddy lives, he threatens all the kids and forces Shazam to return with him to the Rock of Eternity, where he intends to make Shazam transfer the power to him, using the Wizard’s staff. Shazam is able to extricate himself and the kids from the situation and get them back to Philadelphia, but Sivana, now in possession of the wizard’s staff, attacks the crowd at a carnival. At this point, the other foster kids all know that Billy is this new hero (I’ll get to that in a bit). 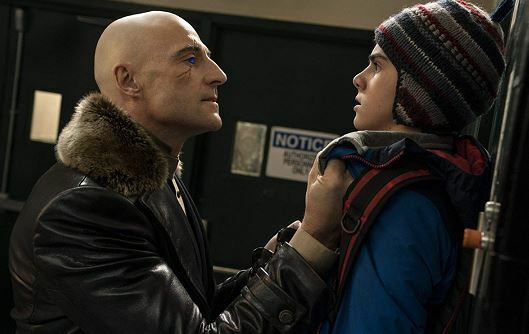 During the battle, Shazam comes to realize the meaning of something the Wizard had said to him, wrests the staff away from Sivana and instructs the five kids to grasp the staff. “Say my name,” he says. Freddy, Mary, Darla, Eugene and Pedro are transformed into super hero versions of themselves, played, respectively, by Adam Brody, Michelle Borth, Meagan Good, Ross Butler and D.J. Cotrona. Led by Mary, they distract the Sins, drawing them away from Sivana and making him that much less powerful. Together, the six heroes stop Sivana and return the Seven Deadly Sins to the Rock of Eternity, where Shazam encases them in stone, as the Wizard had done before. 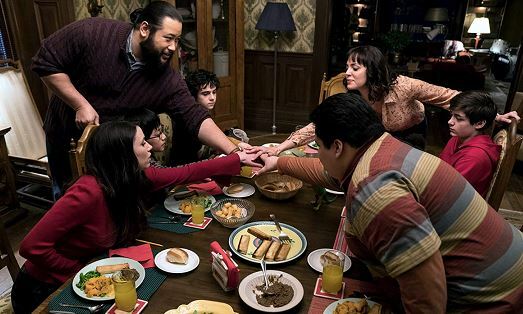 Back at the Vasquez home, Billy, having accepted that these people are his true family, leads everyone in the mealtime ritual. In his cell, as shown in the mid credits sequence, Sivana has a most unusual visitor. Do I recommend seeing Shazam? Sure. It’s not perfect, but it’s still an enjoyable film. In many ways, it’s a movie about family (in all its myriad forms) that happens to concern a superhero more so than it’s a superhero movie, per se. Shazam and his foster siblings, Pedro, Eugene, Freddy, Darla and Mary. In fact, it’s Billy’s foster siblings who help him succeed in locating his mother (Caroline Palmer) when he’d all but given up hope. As to the superhero aspect of the film, I think there may have been a bit too much of Shazam showing off and not enough of him being a hero. Ironically, it may be one of the most realistic superhero movies, despite the fact that it involves magic, because Shazam shows off so much. Billy Batson is 14 and Shazam acts like a 14-year-old might if suddenly given super powers. In-universe, how would Freddy have behaved if the Wizard had chosen him? He’s a fan of both Superman and Batman (he has a bullet that had been fired at Superman, (complete with certificate of authenticity, as well as a replica batarang) and seems more interested in and knowledgeable about superheroes overall than Billy before his transformation. Freddy shows Billy his Superman bullet. Granted, Freddy was enthusiastic about many of Shazam’s “tricks”, and he might have done much of the same, but I suspect he might have been more actively superheroing sooner than Shazam did. Wonder how their approaches to being a superhero will differ in a sequel? I mentioned that the other foster kids know Billy is this new hero. Mary figures it out, which comes as a relief to Darla, who isn’t good at keeping secrets. Earlier in the film, Shazam had saved a distracted Mary from being hit while crossing the street and addressed her by name. He’d also knows other things about her. 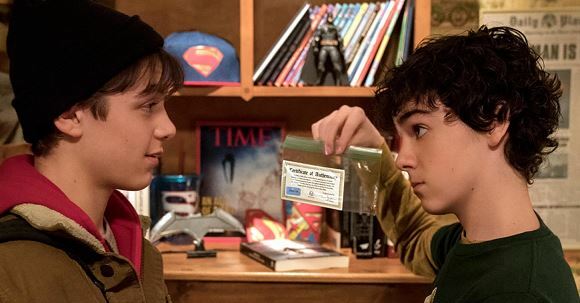 Granted Mary’s very smart, but it’s still a hell of a leap to connect the adult superhero with the teenage Billy Batson. She made the connection based on the fact that A) he knew her name; B) she’d seen Shazam and Freddy together on TV and C) the fact that Freddy and Billy had argued about this new superhero at the dinner table. Of course it helps that Darla immediately confirms her suspicions. 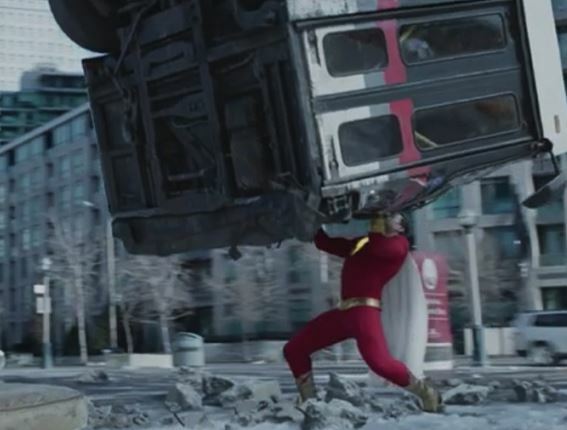 Shazam contains elements of the original Captain Marvel’s origin story (the subway train that leads to the Rock of Eternity, Sivana being the first villain the “Big Red Cheese“ faced), along with aspects of more recent interpretations of the character (Billy having foster siblings who share the power). 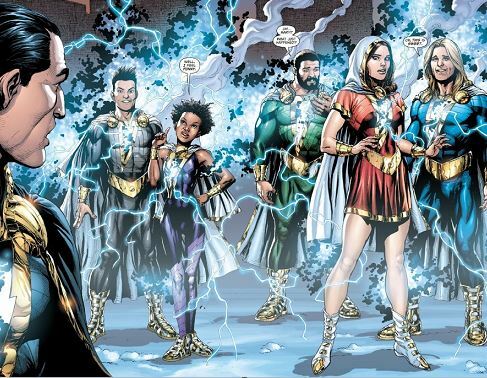 The Shazam family in the comics. 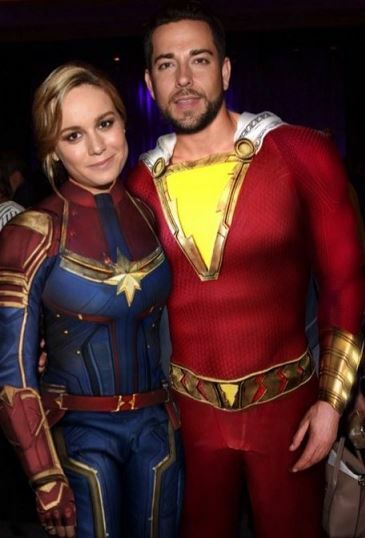 So, what do Captain Marvel and Shazam have in common? Apparently, they hang out together. .And why not? They’re both great characters appearing in enjoyable movies. Even though I’ll be seeing Captain Marvel with friends later this month, I decided to see it on Sunday in part because I was looking forward to seeing it and in part because I didn’t want to inadvertently come across any spoilers in the coming weeks. In the 1990s, a war is underway between two alien races: The Kree and the shaping changing Skrulls. A group of Kree Starforce warriors are assigned to extract a Kree spy whose cover is in danger of being exposed, but the rescue is a trap. A Starforce member known as Vers (pronounced “Veers”) (Brie Larson) is captured by the Skrulls and interrogated. During the course of the interrogation, Vers, who has been haunted by nightmares, has scattered flashes of unfamiliar images from the life of a young woman— images she suspects have been planted as part of the interrogation process. She can’t be sure, because she has no memory of her life prior to joining the Starforce six years earlier. But Vers possesses the ability to fire photon blasts from her hands and is soon able to break free and escape. One of the images she saw during her interrogation was of a woman identified by her Skrull captors as Dr. Wendy Lawson (Annette Benning). She learns that this woman was last known to be on a backwater planet called C-35 (AKA Earth) and heads there intent on learning more about this woman and the Skrulls’ interest in her. Vers is especially interested in learning more about Lawson, about whom she knows nothing, because she sees Lawson’s image when communing with the Kree Supreme Intelligence. In the comics, the Supreme Intelligence looks like Slimer from Ghostbusters with the snakes-for-hair of a gorgon, but in the film, it appears as a particular person generated by an individual’s subconscious. Vers crashes through the roof of a Blockbuster Video store, jury-rigs a communication device from a local Radio Shack (thanks to help from helpful, but confused security guard who points out the building when she asks about communication equipment) and contacts her superior officer (Jude Law) to update him on her status. Her actions attract the attention of S.H.I.E.L.D. agent Nick Fury (Samuel L. Jackson) and his new assistant, Phil Coulson (Clark Gregg). Fury dismisses Vers as crazy— until he sees proof of her claims about the Skrulls first-hand. Witnessing her actions in and on a commuter train also helps convince him. Using the resources of an Internet café and a stolen motorcycle, Vers is able to follow a possible lead to Dr. Lawson: A bar that evokes even more flashes of images/memories. Vers at an Internet cafe. According to the official record, Danvers and Lawson were killed during an experimental flight six years earlier. The trail leads to Louisiana where Danvers is reunited with her best friend, Maria Rambeau (Lashana Lynch), a fellow pilot, and Maria’s daughter, Monica (Akira Akbar). There, she gets the last pieces of the puzzle into the mystery of Dr. Lawson, what really happened six years earlier and how she came to possess her abilities. She also confronts both her fellow Kree Starforce warriors and the Skrulls and discovers that there’s more to the Kree-Skrull war than she’d realized. After completing her work on Earth and giving Fury a special upgrade on his pager, she decides to head into space to do something about the war. Which explains why she hasn’t been part of the Marvel Cinematic Universe before now. And it also gives context to Fury’s “You think you’re the only superhero in the world” comment to Tony Stark in the post credits scene of Iron Man back in 2008. Captain Marvel is a fun movie that’s as enjoyable as any other film in the Marvel Cinematic Universe. Brie Larson and Samuel L. Jackson make a great team— both in terms of the action and the comedy. Carol Danvers and Nick Fury. One thing I liked is that rather than showing images of the various Avengers as part of the Marvel Studios logo, as has been the case in recent Marvel films, Captain Marvel opened with various images of the late Stan Lee. I thought that was an excellent gesture. It’s also fun to see a (relatively) warm and cuddly Nick Fury, given what we’ve known about the character in the other films. Why don’t people within the fictional universe of these Marvel films know about this super-powered woman who turned up a decade before Tony Stark publicly declared himself to be Iron Man? Mainly because much of the public demonstration of her powers took place on top of the train, out of sight of the commuters (she mostly engaged in hand-to-hand combat while on board the train) and because people in the 90s didn’t carry around devices capable of recording photos or video. True, someone with a regular film camera (whether shooting still photos or video) could theoretically have captured her in action, but the photos or video could easily have been dismissed as fakes or been out of focus. There weren’t thousands of images being shared all over the Internet. The mystery woman a few people saw that day would have been a local rumor at most, possibly dismissed as some sort of publicity stunt. I said the film is set in the 1990s, but I’m not entirely sure when. While I’ve read in various places online that it’s set in 1995, there’s a calendar behind Nick Fury in one scene that I’m sure reads 1997. Unfortunately, a friend who also saw the film didn’t even notice the calendar, so I haven’t been able to confirm it. As I said last time, when I discussed the original, Fawcett Comics version of Captain Marvel, the first Marvel Comics character to bear that name was a Kree warrior named Mar-Vell. Mar-Vell appears in the film, but with a few “tweaks” from the comics’ version. Which is fine. As I’ve said before, comics are, in many ways, our modern mythology and myths are often reworked. One Easter egg for comics fans: Maria Rambeau’s call sign is “Photon.” In the comics, Monica Rambeau— one of the many holders of the “Captain Marvel” name — also uses that name as superhero. And why did Nick Fury call the thing he wanted to talk to Tony Stark about “the avenger initiative”? As we learn in Captain Marvel, it had something to do with Carol Danvers. Again, Captain Marvel is an enjoyable addition to the Marvel Cinematic Universe. In 1940, Fawcett Comics introduced one of the most popular superheroes of the era— the original Captain Marvel. Next month, Warner Bros will release a film about Captain Marvel, except both the film and the character are called Shazam, while on Friday Marvel Studios will release a film called Captain Marvel about a woman who has no connection to the Fawcett Comics character. So, who is the Fawcett Comics Captain Marvel, how did he come to be associated with DC Comics and why does Marvel Comics also have a character (several characters, actually) with that name? As related in Whiz Comics #2 (Feb. 1940), a young orphaned newsboy named Billy Batson is brought by a mysterious stranger before a 3,000-year-old Wizard named Shazam who makes Billy his successor. By uttering the wizard’s name, Billy becomes Captain Marvel and is endowed with the wisdom of Solomon, the strength of Hercules, the stamina of Atlas, the power of Zeus, the courage of Achilles and the speed of Mercury. Captain Marvel, initially intended to be called Captain Thunder, was created by writer Bill Parker and artist C.C. Beck. The character proved to be an immediate hit and was the subject of a 12-chapter 1941 serial titled The Adventures of Captain Marvel. It was the first serial to focus on a superhero. That same year, the company now known as DC Comics filed a copyright infringement against Fawcett Comics claiming Captain Marvel was too similar to Superman. In some respects, it should have been the other way around. Captain Marvel was flying from day one. Supes was leaping an 1/8 of a mile to get around in his early years. At any rate, the case dragged on and was finally settled in 1953, with Fawcett agreeing to stop publishing. This was probably due as much to the decline in sales of comics in general as it was the result of the lawsuit. Either way, it seemed that Captain Marvel’s day was done. In an ironic twist, DC Comics would license the rights to the character and revive him in 1973. He would star in a 35-issue title called Shazam, initially illustrated by C.C. Beck. That title ran until 1978. It’s ironic that Superman is re-introducing comics readers to the character. Rick Jones and Mar-Vell trade places. Which isn’t much different than Billy Batson or Captain Marvel saying “Shazam” to change into one another. The most recent Marvel Comics character to hold the title is Carol Danvers. She’s the focus of the Captain Marvel movie opening on Friday. I’m looking forward to seeing that movie later this month with some friends, but, for now, I’m going to keep my focus on the original. For the record, it wasn’t always clear whether Billy Batson, who worked as a radio reporter for station WHIZ, and Captain Marvel were two separate people or whether Captain Marvel was essentially a super-powered Billy as an adult. Captain Marvel was not only a mainstay in Whiz Comics, which ran for 155 issues, but also starred in Captain Marvel Adventures, which ran for 150 issues. He soon became the head of a “Marvel family” that included Billy’s sister Mary, who was originally known as Mary Marvel, and Freddy Freeman, AKA Captain Marvel, Jr.
Freddy actually turned up before Mary did, making his debut in Whiz Comics #25 in 1941. Mary first appeared in Captain Marvel Adventures #18 in 1942. That’s right, Captain Marvel, Jr. can’t say his own name. Especially in his Fawcett days, many of Captain Marvel’s adventures had a whimsical element to them. Take one sequence in the “Monster Society of Evil” storyline that ran in Captain Marvel Adventures #s 22-46 from 1942-1944. The overall storyline pit Captain Marvel against a horde of villains led by the mysterious Mr. Mind. Mr. Mind, we later learn, is a worm (literally). In the sequence in question, he attempts to prevent Captain Marvel from saving Russia (a wartime ally, don’t forget) by tickling him. Mr. Mind tickles Captain Marvel. He also knew Billy Batson transformed into Captain Marvel. Another was Black Adam, who had been the wizard’s chosen champion millennia ago in Egypt, before he turned evil. In more recent years, Black Adam has been depicted in various DC titles as a more complex anti-hero. Among Captain Marvel’s allies was Mr. Tawny, a debonair, civilized tiger who wants to live in the city instead of the jungle. I mentioned that DC published a title called Shazam from 1973 to 1978. During that time, Captain Marvel would star in a Saturday morning TV series called Shazam, which would run from 1974-1977. That series was my introduction to the character. In the comics, Captain Marvel would go on to make occasional subsequent appearances over the years, including as a member of the Justice League in the late 80s. His longest post-Fawcett solo series, The Power of Shazam, ran for 47 issues starting in 1995. The series, which was set in Fawcett City and incorporated elements and characters from Fawcett Comics, as well as from the 1941 serial, followed on from the 1994 Power of Shazam graphic novel. During the run of The Power of Shazam, the series with which I’m most familiar, Mary decided that she had just as much right to the name as her brother and also called herself Captain Marvel. As for Freddy Freeman, he decided to go by “CM3.” At least he could now introduce himself. Speaking of which, as of its “New 52” reboot, DC has taken to calling Billy Batson’s superhero persona “Shazam”, even though he’d been called “Captain Marvel” within the pages of the various comics in which he’d appeared. But doesn’t that mean he can’t introduce himself? Apparently not. Seems Billy must say the word under the right conditions. So, I guess he can introduce himself as “Shazam” and not trigger the transformation, but what if he’s in a noisy, crowded room? 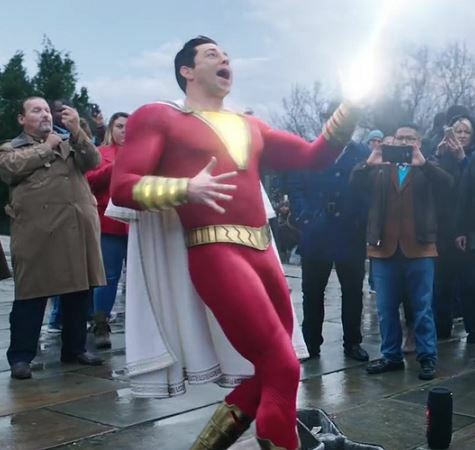 While The Power of Shazam is the longest-running series featuring Captain Marvel since his Fawcett days, he has appeared in several limited series. I especially enjoyed Shazam— The Monster Society of Evil, a four-issue 2007 series written and drawn by Jeff Smith, the creator of Bone. That miniseries, inspired by the original “Monster Society of Evil” storyline, has much of the whimsy of the Fawcett books. In that miniseries, Captain Marvel is an adult, as per usual, but Mary Marvel remains a child. Mary Marvel flies circles around her brother. It’ll be interesting to see how the upcoming movie Shazam portrays the character. 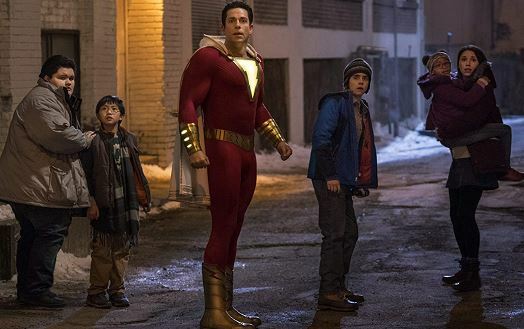 From the trailers it seems clear that the filmmakers see Captain Mar- that is, Shazam as a kid in an adult’s body, but what sort of story will the film tell? Hopefully, a fun one. As to the “Big Red Cheese” himself, his adventures have been assembled in various collections, including Shazam! From the Forties to the Seventies; The Shazam Archives; The Shazam Family Archives; Showcase Presents Shazam and Shazam! A celebration of 75 Years. The storyline “Captain Marvel Battles the Plot Against the Universe”, which ran in Captain Marvel Adventures #100, was reprinted in A Smithsonian Book of Comic-Book Comics, while a story from Captain Marvel Adventures #1 was reprinted in Shazam! : The Golden Age of the World’s Mightiest Mortal. Whether you call him Captain Marvel or Shazam, “The Big Red Cheese” is one of the best and most appealing superheroes of all time. The popularity of the original 1968-1973 Planet of the Apes film series not only resulted in a number of Mego toys, but also two one-season television series; a live action one in 1974 and an animated one in 1975. Today, I’m going to talk about the animated series, which I first learned about around 1981 through a trilogy of novelizations by “William Arrow” (a pen named shared by writers William Rotsler and Donald J. Pfeil). Astronauts Bill Hudson (Tom Williams), Jeff Allen (Austin Stoker, who played MacDonald in Battle for the Planet of the Apes) and Judy Franklin (Claudette Nevins) leave Earth in the Venturer in 1979 only to return in 3979. As in the original 1968 movie, humans are mute (and called “humanoids” for some reason). However, unlike the movie, ape society has technology roughly equivalent to the late 20th century. The animated series was developed for television by David H. DePatie and Fritz Freleng, while Doug Wildey (creator and a supervising art director on Jonny Quest) was supervising director and associate producer. The DVD episode order (which the novelizations also follow) provides a serialized narrative that makes the storyline that much more engaging. In “Flames of Doom”, the Venturer crashes in a lake in a wasteland the astronauts later learn is called the Forbidden Zone. Judy disappears during an earthquake. Bill and Jeff later encounter a group of primitively dressed people, including a woman called Nova (also Nevins), living in caves. Nova wears dog tags belonging to a man named Ronald Brent (born 2079). To the astronauts’ shock, the caves are attacked by talking gorillas in military vehicles. Jeff escapes, but Bill is captured. In “Escape from Ape City”, chimpanzee scientists Dr. Cornelius (Edwin Mills) and Dr. Zira (Philippa Harris) discover that Bill, whom Zira names “Blue Eyes”, can talk. Knowing his life is in danger, they help him escape. A gorilla sentry tells orangutan politician Dr. Zaius (Richard Blackburn) about the “talking humanoid”, but Zaius— who knows that humans once ruled the planet— has no direct evidence that Bill could speak. However, he decrees that if one humanoid is found to be capable of speech, all of them must be killed. Ambitious (and increasingly paranoid) gorilla General Urko (Henry Corden) makes capturing “Blue Eyes” one of his primary goals (along with wiping out the humanoids and taking control of the government). Reunited, Bill and Jeff free the humanoids and destroy the wagon cages. They decide that the humanoids need a safer place to live and that they should retrieve their laser drill. In “The Unearthly Prophecy”, (Called “A Date with Judy” in the first novelization) Bill and Jeff discover the hidden world of the Underdwellers, a race of advanced humans. They also discover the ruins of New York and realize they’re back on Earth. Bill and Jeff in the subway. They’re reunited with Judy, who is under some form of mind control and whom the Underdwellers hail as “Usa” (pronounced “Oosa” and spelled that way in the novelizations for some bizarre reason), the fulfillment of an ancient prophecy (a bust of her features the inscription “Lost— U.S.A.”). Bill and Jeff snap her out of the mind control, but are forced to escape alone, promising to come back. In “Tunnel of Fear”, Bill and Jeff seek help from Cornelius and Zira in finding a safer home for the humanoids. Cornelius takes them to his archaeological dig and tells them he’s heard of an unexplored valley some 90 miles south. Meanwhile, Urko becomes suspicious when he learns that Cornelius went to his dig without his tools. In “Lagoon of Peril”, the astronauts retrieve their laser drill, but face danger from both an ape expedition into the Forbidden Zone and from something in the lake itself. This episode establishes that the apes literally refer to their world as “The planet of the apes.” The front page headline of The Ape City Tabloid reads, “Intelligent Humanoids Invade Planet of the Apes?” and a TV news anchor uses the same phrasing. In “Terror on Ice Mountain”, Cornelius and Bill use a hot air balloon to hide a book titled A Day at the Zoo —which Urko would use as a pretext for destroying the humanoids if he found it — high atop a mountain. In “The River of Flames”, a holographic image of Judy seeks help on behalf of the Underdwellers. They need the laser drill to create a vent in the mountainside to divert a river of molten lava that would destroy their civilization. Urko inadvertently helps by blasting the mountain with a howitzer, but loses all his equipment in the resulting lava flow. Krador, the leader of the Underdwellers, releases Judy, who promises to return if needed. In “Screaming Wings”, Urko gets hold of a World War II-era airplane with which he intends to both take over the government (he makes that point clear to Zaius) and destroy the humanoids. Bill and Jeff destroy Urko’s airplane factory while Judy steals the plane, which they hide in a cave. In “Trail to the Unknown”, the astronauts ferry the humanoids down the river in four large wooden rafts, followed by a trek across the desert, in order to reach New Valley. They finally meet Brent, whose flight launched Aug. 6, 2109. Brent estimates he crash landed 15-20 years before the Venturer. Brent knows about New Valley and used to fish there, but doesn’t know about the apes. Meanwhile, Zaius gives Urko permission to find out where the humanoids have gone, but says he needs a mandate from the Council of Elders before he can attack. In New Valley, the astronauts use the laser drill to make building blocks out of large boulders and construct pueblos. “Trail to the Unknown” is the last episode adapted for the novelizations. In “Attack from the Clouds”, a large dragon-like creature (“the monster bird”) terrorizes both Ape City and the valley. Meanwhile, Zaius makes it clear that he’ll look forward to dealing with Urko in the appropriate way if he fails to capture “Blue-Eyes”, but will authorize a full scale attack against the humanoids if he succeeds. Bill and Judy retrieve the plane, barely eluding an ape patrol. However, the monster bird attacks when they reach the valley. In “Mission of Mercy”, the astronauts must obtain a cure for a disease that has affected Nova and will become communicable in 36 hours. They also need more fuel for the plane in order to effectively protect the valley. Judy flies to Ape City to seek help from Cornelius and Zira in creating a cure while Bill and Jeff use a stolen truck to steal fuel from the apes’ aviation plant. In “Invasion of the Underdwellers”, Urko and a band of his gorillas commit a series of robberies disguised as Underdwellers as part of a plot to start a war. The astronauts foil Urko’s plans and Zaius makes him and his accomplices personally return everything they’ve stolen. The Council suspends Urko from duty without pay for three months and orders him to make a public apology on national television. In “Battle of the Titans”, Cornelius and Zira decide that with Urko out of power, it’s the right time to retrieve the book that proves humanoids once ruled the Earth and present it to the Senate. Meanwhile, Urko plots with one of his colonels to attack the humanoids. As the army prepares to attack the valley, Judy uses the plane to frighten and scatter the ape soldiers. The episode (and the series) ends with Cornelius and Bill heading back to New Valley in the balloon, so we never get a chance to discover how the Senate would have reacted to the book. Nor do we learn whether Zaius or Urko wins their power struggle. I don’t know how well remembered Return to the Planet of the Apes is these days, but both the episodes on DVD and the novelizations (which go into a bit more depth) are worth checking out if you’re an Apes fan. One thing I like about the CW “Arrowverse” is that the producers of Arrow, Flash, Supergirl and Legends of Tomorrow decided to incorporate, with some changes, the old DC Comics multiverse when it would have been easy enough to just have all the shows take place in the same television universe. Sure, it’d be harder to explain, in-universe, why Supergirl doesn’t show up in either Star City or Central City more often, but then but by that same logic we’d have to wonder why the Flash can’t take a few minutes out of his day to help out in Star City. Anyway, as I’ve said before, my first encounter with the DC multiverse was in 1979 when I read Adventures Comics #462 in which the original (Earth-2) Batman died. To the best of my recollection, I next encountered the “golden age” heroes of Earth-2 in 1981, in a three-part storyline in Justice League of America #s 195-197 in which the JLA of Earth-1 once again teamed up with the Justice Society of America of Earth-2. I thought I’d revisit it. The Earth-1 villains Killer Frost, Signalman, Cheetah and the Floronic Man join forces with the Earth-2 villains the Monocle, Psycho Pirate, Rag Doll, the Mist and Brainwave— all led by the Ultra-Humanite— to defeat the JLA members Atom, Batman, Black Canary, Firestorm and Wonder Woman and JSA members Flash, Hawkman, Hourman, Johnny Thunder and Superman. Ultra has a plan that centers around the elimination of those 10 heroes from the multiverse. The Ultra-Humanite explains his plan. There’s no chance he could be lying, is there? Of course he is. He knows full well the Earth-2 heroes will vanish. When the Earth-1 villains realize they’ve been tricked, they’re not at all happy. They might even go so far as to free the imprisoned heroes. Trying to free the heroes. The Ultra-Humanite, who first appeared in Action Comics #13 in 1939, is a recurring foe of the Earth-2 Superman who’s transferred his brain into multiple bodies over the years. At this point, it occupies a huge, white gorilla. In his first appearance, the Ultra-Humanite was depicted as a bald (or balding, depending on how he was drawn) genius. More on that in a bit. But first, why do the heroes and villains of the 30s and 40s, the original ones from a publishing point of view, live on Earth-2? In DC Comics Presents Annual #1 (1982), Lex Luthor of Earth 1 and Alexi Luthor of Earth 2 join forces. At one point, they travel to Earth 3, where the analogues of all the heroes are villains. Lex explains who they are and where they’re from to Ultraman, the analogue of Superman on that Earth. Lex Luthor explains the multiverse to Ultraman. In the comics, the Earth-1 Flash, Barry Allen, accidentally crossed the dimensional barrier and met Jay Garrick, thus Barry lives on Earth-1 and Jay on Earth-2 because of the order of discovery. By that same logic, since “Jay Garrick” crossed over from his Earth in the Flash TV series in season 2, shouldn’t his world actually be called Earth-1? I get calling Supergirl’s home Earth-38 because Superman first appeared in 1938 (and without him she wouldn’t exist, either) and the Flash of the 1990 TV series coming from Earth-90, but it’s curious how various characters from different Earths all seem to agree that Barry, Oliver and the Legends live on Earth-1. Even Breacher (Danny Trejo) the bounty hunter father of Gypsy (Jessica Camacho), who has been aware of the multiverse for decades, calls the home of Team Flash Earth-1. From his point of view, shouldn’t his own world of Earth-19 have better claim to that title? It’s a minor point, but I somewhat wish there’d be an in-universe explanation as to how pretty much everyone agrees that Earth-1 is Earth-1. Of course, the real world explanation is that the action in most of the “Arrowverse” TV shows take place on that Earth. On that note, I enjoyed the second and third parts of the “Elseworlds” trilogy from a few weeks ago. It would have been nice if there’d been a quiet moment for the Barry Allen of Earth-1 and the Barry Allen of Earth-90 to have a brief conversation, but it could still happen in next year’s “Crisis on Infinite Earths” storyline. No, I don’t believe the Monitor killed the Earth-90 Flash. He disappeared in the same type of puff of smoke that teleported Supergirl a few feet. I think the Monitor just sent him far away. It was amusing (and a bit meta) for Oliver to insist that Batman is a myth created by the Gotham City police department and to emphasize that he is the original vigilante. On the one hand, that’s true; Arrow was the first of these shows to air (which is why it’s called the Arrowverse), but in the comics Green Arrow was seen for years as a pale imitation of Batman. I also liked seeing Supergirl and Batwoman work together, albeit briefly, and their mutual acknowledgement that a team up would be the worlds’ finest. And it turns out John Diggle is a green lantern on Earth-90. Given how he’s handled so much else related to superheroes and metahumans, how would the Earth-1 Diggle react to receiving a power ring? In his earliest appearances, Luthor had red hair. Later, he became bald, but once the multiverse was established, the Earth-2 Luthor retained his hair while the Earth-1 Luthor didn’t. Lex Luthor and Alexi Luthor. It’s generally believed that an artist confused the Ultra-Humanite with Luthor and Lex suddenly lost his hair. As you can see, there is a bit of a resemblance. In his 2001 Elseworlds story Superman & Batman: Generations II, writer and artist John Byrne established that the man Superman thought was Lex Luthor was really the Ultra Humanite in Luthor’s body, essentially making the two characters the same. That tale, and the one before it, imagined Superman and Batman appearing on the scene in 1938 and 1939, respectively and aging in real time. Two years ago, I theorized that the 1990 Flash series and the current series are part of the same multiverse, suggesting that the Barry Allen of that series (John Wesley Shipp) lived on Earth-90 (for 1990). The scene depicts Shipp, wearing the Flash costume from the 1990 series, confronting the Monitor (LaMonica Garrett) before rushing off, accompanied by a brief sting of the 1990 series’ theme music. Although Shipp didn’t appear in the actual episode tonight (I thought for sure that he’d show up at STAR Labs in the tag), his incarnation of the Flash will cross the dimensional barrier and meets the Earth-1 Flash (Grant Gustin) and Green Arrow (Stephen Amell), along with Supergirl (Melissa Benoist) from Earth-38 in either tomorrow’s episode of Arrow or Tuesday’s episode of Supergirl. Of course, when that happens, the Earth-1 Barry Allen is going to have more on his mind than meeting another speedster who looks like his late father, but this time happens to share his name (Shipp has played both Henry Allen and the Earth-3 Flash, Jay Garrick, on the current series); he has to deal with the fact that something has changed reality so that everyone (on Earth-1 at least) thinks he and Oliver are each other. On top of that, they have each other’s abilities, which took some adjusting on both their parts. The viewers know that the Monitor gave Dr. John Deegan (Jeremy Davies) a large book (probably the Book of Destiny), with which Deegan has changed reality, but all the characters know, thanks to Cisco Ramon (Carlos Valdes) using his Vibe abilities, is that the encounter took place in Gotham City. They still have no idea who either of them are, however. In last week’s tag scene, the Monitor opened the book and said, “all of you will perish”, implying that he used it to destroy Earth-90, with the Flash as the only survivor. On the other hand, “all of you” could refer to the multiverse as a whole. In a trailer for the crossover, the Earth-90 Flash warns of a coming crisis, which may or may not refer to the event mentioned in a newspaper article from April 2024, seen as early as season one of The Flash. The presence of The Monitor in the “Elseworlds” storyline suggests that the crisis in question will be the “Arrowverse” version of the 1985-86 maxi-series Crisis on Infinite Earths. One feature of the Crisis was red skies, which were mentioned in both the 2024 newspaper article and in tonight’s episode (though they weren’t seen). While the Earth-90 Flash wasn’t part of events in tonight’s episode, Supergirl, Superman (Tyler Hoechlin) and Lois Lane (Elizabeth Tulloch) were. After escaping from the STAR Labs pipeline, where Team Flash had imprisoned them in the belief that they’d suffered a shared psychosis, Barry and Oliver traveled to Earth-38 to find out if Supergirl had also been affected. A bit of the Smallville theme played during the first scenes on Earth-38, which might seem odd, but it’s probably a reference to the fact that Kent farm in the episode is the same farmhouse used in Smallville. There may be another overall Smallville connection, however. Last week’s tag showed someone dressed as that show’s incarnation of the Green Arrow among the dead and dying heroes on Earth-90. Of course the speedster on Smallville was Bart Allen, AKA Impulse (Kyle Gallner), not Barry Allen, but that doesn’t necessarily mean the Barry Allen Flash didn’t exist in the same universe as Smallville. Or it could just mean that at least two Earths have similar superhero sartorial styles when it comes to their emerald archers. At any rate, Supergirl and Superman help Flash and Green Arrow defeat Amazo, a robot (android in the comics) with the ability to replicate their powers. And with that threat neutralized, they’re off to Gotham City, where they’ll end up crossing paths with Batwoman (Ruby Rose), making her debut in the Arrowverse. Amazo was activated during an attempted robbery at Ivo Industries. In the comics, Amazo was created by created by Professor Ivo, while the late Anthony Ivo (Dylan Neal) was an adversary in season two of Arrow who operated off a boat called The Amazo. Sounds like someone’s been carrying on his work. Unless of course the robot Amazo’s existence is due to Deegan’s alterations to reality. Maybe we’ll learn more about that tomorrow. In the meantime, while we have to wait a bit for the Barry Allen of Earth-90 to meet the Barry Allen of Earth-1, tonight’s episode had some fun moments. Among those was Barry wondering if he and Oliver were in a Freaky Friday situation, before deciding it was probably a Quantum Leap one— and then asking for a mirror. Then there was Barry finally getting revenge for Oliver’s “training methods” years ago. I enjoyed tonight’s opening installment of the “Elseworlds” trilogy and am looking forward to how the rest of the story plays out. When 13-year-old Pug Allen moves with his parents and younger sister, Helen, to Dibble Hollow, an 18th century farmhouse is mother inherited, he expects to spend an enjoyable summer in the country. However, from almost the moment they arrive in town, Pug and Helen run afoul of a crotchety old man named Eb Smith, their next-door neighbor, who holds a decades-long grudge with the Dibble family. On top of that, people in town refer to Dibble Hollow as “that spooky place” and Pug’s dog, Ricky, won’t go into the room Pug chose for himself. That’s probably because the room already has an occupant, the ghost of 10-year-old Miles Dibble, Pug’s maternal great-great uncle, who introduces himself by asking Pug not to sleep in his bed. Miles, who died 60 years earlier in 1900, had been responsible for the home’s spooky reputation, but is more than willing to help the Allen family, given that Mrs. Allen is a Dibble and that Pug (full name Elisha Nathanael Dibble Allen) is the spitting image of Miles’ brother, Nathanael. When Pug’s parents consider leaving after the well connected to the house appears to be dry, Miles tells Pug how to access a second well, linked to the first. He also needs Pug’s assistance in helping Eb Smith, his best friend, who is raising his granddaughter, Priscilla, and is in danger of losing his home of Twin Maples because of financial difficulties. Eb Smith’s feud with the Dibbles dates back to the day of the fair in 1900, when Miles disappeared. According to Miss Woodman, a contemporary of Miles and Eb, the two families had made quite a bit of cash at the fair and Miles’ and Eb’s respective older brothers had charged them with bringing the money home rather than do it themselves. A suspicious pair of men followed the boys, who split up. Eb was to lead them on a wild goose chase while Miles took the money home. But neither Miles nor the money was ever seen again. The Smiths accused Miles of running off with the money, especially since Eb Smith hadn’t seen the suspicious men, only taken Miles’ word about them; In turn, the Dibbles accused the Smiths of doing away with Miles and keeping the money for themselves. According to Miles, the would-be crooks doubled back and started going after him. He’d had time to hide the money, but subsequently lost his footing in the dark on a rickety old bridge and fallen to his death in the river below. The men found his body and shoved it into the river current. It was discovered by a man in a neighboring town and buried in the family plot in lieu of his son, who was lost at sea. The problem is that Miles, who can only appear to a Dibble boy under 15, and one other person, can’t remember where he hid the money. He only knows he put it in a tree, but the area is teeming with trees. He needs Pug’s help to find it in order to save Eb Smith’s home and restore the Dibble-Smith friendship. Pug knows that searching for the missing money alone isn’t enough, so he also makes arrangements with the president of the local bank to do yard work at his house so the banker’s handyman will be free to help get the Smith place in good repair. He would have happily helped out on the Smith place himself, but knows he wouldn’t be welcome. Meanwhile, Helen and Priscilla have a plan to raise money for Mr. Smith by selling some antique furniture. Pug and one of the local boys helps in that endeavor, too. Ironically, this boy is related to the man who holds the mortgage. But Pug still needs to find the hidden money in order to save Eb Smith’s farm and repair the rift between the two families. But Miles has had 60 years to search, without success. How can Pug figure out the hiding place based on Miles’ imperfect memories and the scant clues he’s uncovered before the mortgage comes due? I first read The Ghost of Dibble Hollow, written by May Nickerson Wallace and illustrated by Orin Kincade, in grade school and the story stuck with me long after I’d forgotten both the name of the book and some details of the plot. But I remembered that it concerned a ghost named Miles who was buried in a different town and not under his own name. I think it was a fellow Three Investigators fan who provided me with the title and I was then able to hunt down the book in a used bookstore a few years ago. In Pug Allen, Wallace gives us a resourceful boy who not only figures out the identity of the “other” to whom Miles appears and also deciphers the code in Miles’ diary, but also turns a potential adversary into a friend and convince adults to listen to his ideas. Helen is also depicted as smart and resourceful, something both Pug and Miles acknowledge, though she plays a smaller role in the story and never learns of Miles’ existence. As for Miles, he may be dead, but he’s still your typical 10-year-old, helpful at some times; a prankster at others. The Ghost of Dibble Hollow is an engaging mystery that kids will enjoy reading and adults will enjoy rereading. If you find a copy at your local used bookstore, it’s worth picking up.